Tomorrow, During the Malayalam Mass, we will have a collection for the Youth Retreat. Your generosity will greatly be appreciated. Below are a few important updates/reminders about the retreat happening at our church today, Friday, July 27th through Sunday, July 29th. Please keep this youth retreat in your prayers!!! Thank you for your support. Fwd: Retreat registration ends Wed at midnight!! 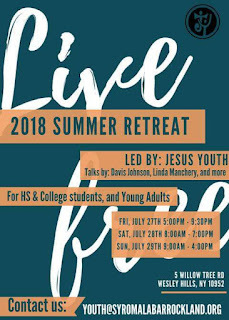 With over 100 youth already signed up for Live Free: Rockland's 3 Day Jesus Youth Retreat, registration will close today at midnight! We will not be allowing walk-ins or late registration. Don't miss out on this great opportunity and register your kids now! Please register using this link: https://goo.gl/forms/MAQgmASVtDyl1F0j1. Please know that the proposed joint meeting of Parish Council, Finance Committee and Building Committee is NOT happening due to the inconvenience of most of the expected attendees. Our parish is hosting a 3 day Jesus Youth retreat this summer! This retreat is for high school youth, college youth, and young adults (up to age 30). Additionally, we are looking for homes who are willing to provide accommodation for youth from other parishes. All meals will be provided by the parish. Please respond to this email if you're interested. This retreat is open to all parishes in the Northeast so please help us spread the word! More information can be found in the attached flyer. CCD and Malayalam School Anniversary Day today at 6.30pm. Our CCD and Malayalam School Anniversary day is Today and all are invited to join us at church social hall by 6.30pm. Please see the attached flyer for the Information about the Jesus Youth retreat. On July 4th, Wednesday, at 2pm there will be a Funeral Mass for Mathai Thekkekunnel (Father of Cherian Mathew- Jaya) at our church (St. Boniface, 5 Willow Tree Rd, Wesley Hills, NY 10952) followed by viewing until 5.30pm. The Family has decided to have Mr. Mathai's burial at the Kothamangakam Cathedral cemetery in Kerala by this weekend. It is with profound sadness that I inform you that dad of our Cherian Mathew, Shri. Mathai Thekkekunnel, (91) passed to eternal life this morning. We, as a Parish express our deepest sympathy to the Thekkekunnel family at this time of great pain. Please pray for the repose of Mathai Chettan's soul. May he Rest In Peace and let perpetual light shine upon him. A huge thank you to everyone who joined us on our annual Picnic/Sports day June 23 2018!! By the grace of God and Mother Mary the weather stayed dry and the sun shone some of the time. Thank you Fr. Thadeus for prayers and continuous guidance. We appreciate the time taken from your busy schedule to come along and support the event. It was so nice to see both parishes working together as a family to help organize the event. We would like to thank everyone who helped some way or other, whether it was by praying, encouraging, planning, purchasing, organizing, preparing/cooking food and cleaning to make our picnic one of the best. Nearly 300 people from both parish's attended the picnic. We are sure you will all agree it was a huge success, because not only did the children have a great time but the adults/ parents did too! Well done to the Green Team who came in first place. The day was organized in an extremely impressive manner by our Sports coordinators and team captains. Thanks to the Padannamakkal Family for sponsoring the ever rolling trophy. The bouncy house and Tattukada was the highlight of the picnic which kept going until the end. The raffle tickets and 50/50 was an easy and simple fundraiser that brought more donors and kept people engaged and having fun throughout the event. Thank you for all the donations and welcoming new ideas. The variety of food we had added more flavours and spices to the day. The purchasing team and cooking team did a great job preparing food and getting the food ready for us. We can't forget the people who kicked start our day with warm homemade breakfast starters and goodies. Thank you to the photographers for the amazing photos and videos, people who couldn't make it on saturday for the picnic were able to relive the day through pictures. Cleaning is usually the hardest part but the great help from kids and adults made it easy. I am also very grateful to all my coordinators for playing their part in ensuring that everything ran so smoothly. These include everyone who was running an event as well as planning. A special thank you for the unseen work we all did and we look forward to next year. I have been asking at church for volunteers to organize spiritual programs for our Teens, Youth and Young Adults. Here is an opportunity to all those who have been thinking about helping. We have a "Jesus Youth Team" conducting a youth retreat at our church on July 27-28-29 (Friday to Sunday). If you are willing to help with the retreat on one or all of three days or even for a few hours, please attend a meeting after today's 11.00AM Mass in the rectory living room. We also need a group to do intercessory prayers with Adoration during the retreat hours. Please let me know who is willing to pray for our youth as they attend the retreat. I have been trying to get our new priest Rev. Fr. Kevin Mundackal to offer a Holy Mass at our church since the day he was ordained. As a pleasant surprise, yesterday, Saturday, Fr. Kevin called me and said he is free to offer Mass with us today (July 1) at 11.00AM. Next Sunday, Fr. Kevin needs to go to Chicago, to start his first assignment. Let us keep him in our prayers as he begins his priestly ministry. I just wanted to give you a heads up about the special blessing that's coming our way this morning. Please see and read the attached Pastoral letters from our Major Archbishop His Eminence George Cardinal Alencherril and our Bishop Mar Jacob Angadiath.